The Going Home Dometop Red Adult Urn is hand casted from solid brass, which has been beautifully polished to create a gentle sheen. The detailed engraving shows doves flying home over a backdrop of intricately patterned mountains and a deep red enamel sky. The Going Home Dometop Red Urn is 10.5" high and 6" in width at its widest point. 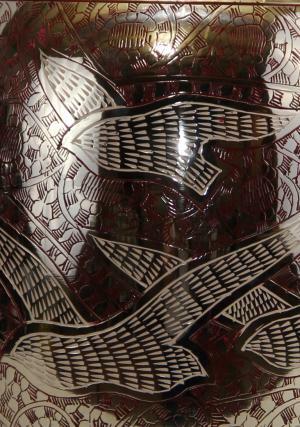 It will hold the ashes of an adult, and is kept secure using a threaded lid and neck. The urn weight 1.82 kg unfilled. 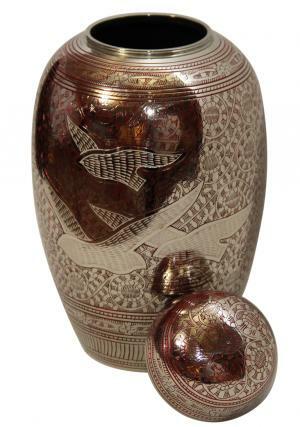 The unique design on this urn has been hand-crafted by skilled artisans to reflect the peace and tranquillity of your loved one's final journey. Its classical appearance makes it suitable for most funeral occasions, both in religious and secular services. Please note that the Going Home Dometop Red Urn is matched by our Going Home Keepsake Urn. 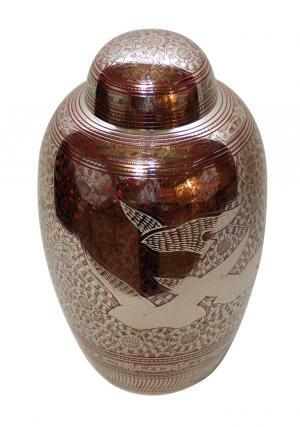 The keepsake urn is a miniaturised version featuring the same beautiful dove engraving, designed to hold a small quantity of a loved one's ashes for home memorial use. Prices shown include postage and packing to mainland UK addresses. 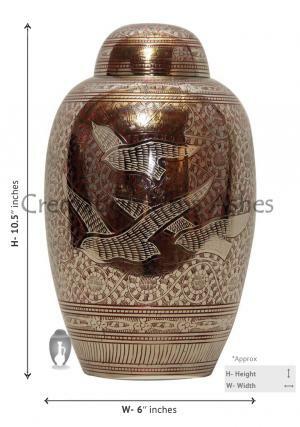 Customers purchasing urns from addresses other than mainland UK can contact us for further delivery information. 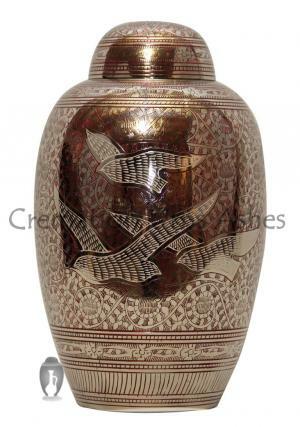 If the urn is ordered before 3pm on a working day, it will ship to arrive within 3-5 business days from time of ordering. Special delivery may be requested by calling us on 020 8004 6667. If you have any questions about the Going Home Red Dometop Urn, please email us at cs@cremationurnsashes.com. We will be delighted to help.